The mind-alteringly hilarious Melbournian siren otherwise known as Marieke Hardy last week wrote an article on “literary tattoos” for The Age, which you can read here. She suggests that tattoos don’t strictly have to be quotations in order to qualify as “literary tats”… I’m not sure if mine would fit into this category, or if my next planned piece of ink will either – something unoriginal (I’ve seen it on someone) yet witty: a set of quotation marks which open on one shoulder blade and close on the other. 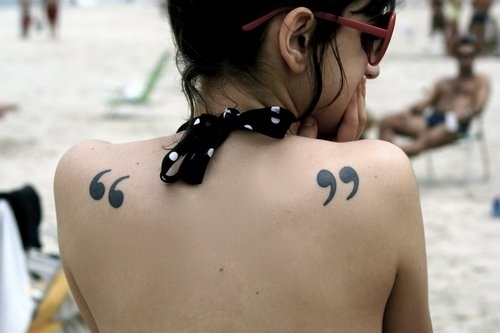 While I certainly applaud those who sport quotations, I’d be terrified about putting someone’s words on myself. Some authors have been with me for a very long time – Roald Dahl, Enid Blyton, John Marsden, C.S Lewis, Ginsberg, Kerouac… But I’d be so scared of choosing the wrong words, for fear of there being more poignant words I could possibly have printed on the fleshy loveliness that is my body. Do you have a tattoo that does this? Do you see another function for having someone else’s words tattoed on your body? Do you agree with it? Since you mention Enid Blyton as being one of the authors that has been with you for a very long time, I am glad to inform you that I have published a book on her, titled, The Famous Five: A Personal Anecdotage (www.bbotw.com). Thanks Stephen, I’ll be sure to check it out. I’ve seen people who have tattoos of their characters,or quotations from their own work. As a writer, I’d rather have something of mine vs. something that somebody else wrote. But for people who aren’t writers, they might run across a sentiment that explains something in a way that they can’t say themselves. It’s almost like a gift. I think that would be fine. Do you have any of your own, Mercedes? or if you were to get something of your own, what would it be? how much did this tattoo cost? Good question? I can’t remember to tell you the truth. I think most tattooists in Melbourne charge about $150+ an hour of work, but it really depends how detailed the work is, and who’s doing it. For the design, he’s a friend of ours so we worked payment out in PS3 games, haha! i really like the quotation marks on the back tattoo. all i want to know is what it means? I”ve always wanted “We accept the love we with we deserve.” tattooed on my left shoulder, but that’s not the first tattoo I will be getting. The tattoo that I am going to get first will be placed on my the upper left side of my body; it will have quotation marks and the infinity symbol in the middle. It stands of the infinite amount of things I should have told my grandfather before he past. Wow, that’s a really lovely idea. You should get it! Im getting the quotation mark tattoo late this month because to me I feel like people are always expecting me to be a certain way and do certain things. There is a blank between my marks because everyday and every moment is different, therefore the quote is constantly changing. In my eyes my life is unwritten because I am still writing my story.. to me my story can not be summed up by one line forever on my body.